We all know the feeling of being lost. It’s frustrating. That’s the case whether we’re literally lost on a trip or figuratively lost in trying to solve a vexing business challenge. There are times when we can all use a good roadmap. Well, the analyst firm Gartner has just released an excellent report to help organizations navigate the bewildering world of employee communication and collaboration technology systems. The July 2018 report, “What to Do When Cloud Office Technology Is Not Enough” is incredibly insightful for businesses looking to enable employees to do their best work. Here’s the thesis: While cloud office suites are foundational for every business, they aren’t the complete answers. The report offers a structured framework that organizations can use to determine what they need to supplement those solutions when faced with a confusing array of options. 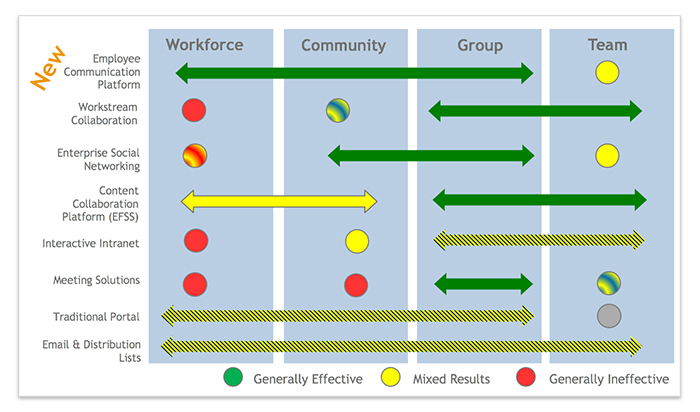 Gartner’s ACME framework, “recognizes that different types of tools can solve the same problem and that organizations need a portfolio approach and decision-making model that balances enterprise desires for commonality with business-unit-level desires to optimize around their unique needs,” the report states. Like all good roadmaps, the report shows you how to get where you want to go. This is the first structure we’ve seen that clarifies what we see as a noisy, complicated space. Employees have higher expectations about how to communicate and collaborate on the job. Even the most comprehensive cloud office platforms aren’t designed to meet their demands. So, there are a growing number of solutions addressing those challenges. Gartner identified three primary use cases that every organization is encountering and then presents a structure for making decisions to solve each of them. We believe these use cases are especially educational for organizations who are seeking to improve the employee experience while also providing control, visibility, and measurability while identifying the limitations of universal, foundational technologies. Gartner explores how cloud office suites can be complemented with solutions that enable organizations to achieve all of their goals. We feel the report carries weight because Gartner is perhaps the sharpest observer of communication and collaboration technologies. The three analysts who prepared this report – Mike Gotta, Monica Basso, and Nikos Drakos – have spent years charting the evolution of the evolving digital workplace. They’re objective. They’re credible. The Gartner team already had done outstanding work defining the changing world of employee communication and engagement. Here’s a chart previously created by Gotta. Now this report, we believe, is the next step in Gartner’s thinking about how to evaluate solutions and determine which ones fit best into your technology architecture. Communicators, marketers, and HR professionals continuously tell us at Dynamic Signal that the way organizations engage with people at work is entirely inconsistent with the way people communicate in their everyday lives. The result is frustrated employees. They want information in bite-sized nuggets that come to them, wherever they happen to be. They can do that in their personal lives, and they want that ability in their work lives, too. The world is too competitive for organizations to not connect with employees in a way that equips them to do their best work. That’s why if you’re embarking upon a journey to select employee communication technology, this Gartner report is a valuable roadmap. It could very well save you a great deal of frustration.